The balloon milkweed or balmelkbossie (Gomphocarpus physocarpus, previously known as Asclepias physocarpa) belongs to the large family Apocynaceae, which has a worldwide distribution but occurs mainly in the tropics and subtropics and comprises trees, shrubs, succulents, herbs and trailing vines. In South Africa, familiar garden plants belonging to this family include frangipani (Plumeria) from Central and South America, Mexico and the Caribbean, oleander (Nerium oleander) from north-west Africa, the Mediterranean, Arabia and southern Asia, and the winter-flowering impala lily (Adenium multiflorum) from northern South Africa and southern tropical Africa, which is often grown as a container subject. Most members of this family produce milky latex when injured, which Is poisonous if ingested. 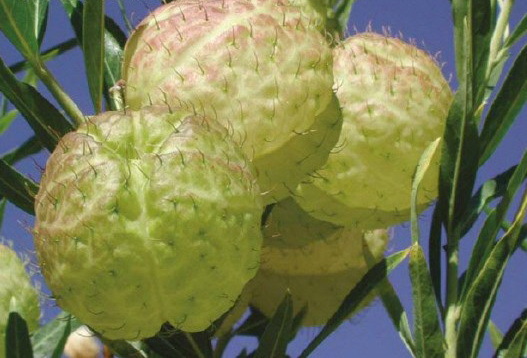 Occurring widely in all provinces of South Africa except the Free State, Northern Cape and Gauteng, the balloon milkweed is often found in grassland in seasonally wet areas and in disturbed sites along roadsides, and its distribution ranges north to Kenya in tropical East Africa. It forms a slender deciduous shrub with a solitary narrow trunk that branches well above the base. It has narrow, lance shaped leaves produced in opposite pairs, and hanging clusters of star-shaped cream flowers produced on long flower stalks. After flowering, the developing fruits transform into dozens of large, light green inflated balloons that become reddish with age and are covered in soft spines. When ripe, the balloons split lengthwise, releasing a multitude of aerodynamic seeds, each with long silky hairs that enable the seed to float in air currents, landing some distance away from the mother plant. The balloon milkweed has beautiful ornamental fruits and is a quick-growing, easily cultivated but short lived plant, providing interesting contrast In the garden. It is usually treated as an annual but can lost for two years if kept lightly pruned after flowering and well watered in summer. It grows 0.5-2 m high and is ideal for large rock gardens, placed towards the back of herbaceous borders or along a fence. It likes full sun and is not very fussy as to soil type as long as it is well drained, but performs best in well-composted media. The plant is a sought-after food supply for the large, brownish-orange African monarch butterfly, which feeds on its nectar and lays it's eggs on the leaves, which arc then consumed by the caterpillars. Due to the poisonous leaves, stems and fruits it is important not to grow this plant where young children may come Into contact with it. Propagation is from seed sown in deep seed trays in a well drained sowing medium in spring or early summer. Germination takes place within 2-3 weeks and once seedlings are large enough to handle (about 10 cm high) they should be dug up carefully and planted out directly into open ground and kept well watered until established. Flowering can take place at any time of year but is mainly in summer and autumn. If harvested when still green (before they start splitting), fruiting branches of the balloon milkweed make interesting additions to both fresh and dried flower arrangements.